M&A Advisors in the USA are a varied lot. Some of these professionals are often selling companies or listing companies for sale. Many sales back grounded people gravitate to this career. They may have sold real estate or maybe a local business or two. These folks are more aptly named business brokers because they add little value outside of making the connection between buyer and seller. True M&A Advisors are people that are strategically influencing or assisting companies with focused M&A programs. M&A is an effective way for companies to build long term value. Companies that lack this skill set internally should bring on a M&A Advisor to help them manage a program. 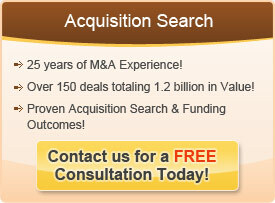 Often M&A advisors in the USA provide what is known as acquisition search services. This service is in high demand and allows companies to plug into deal flow of potential acquisition targets. This specific service allows a company to pinpoint the exact type of target they are seeking and gives them a focused resource to manage the acquisition through the various stages of the process – from identification to valuation to negotiating the letter of intent to due diligence and to closing. This type of M&A Advisor is actually more precisely known as a buy side M&A advisor because they are not selling a company but rather assisting in the investment process of buying a company. This distinction is quite useful when searching for the right M&A Advisor for your company. Buy side M&A Advisors will help your build your company. While business brokers will help you sell a company. Be sure to vet the background and experience level of each advisor that you are qualifying.